Funky ‘cow’ patterned Mark Twain Crescent filler. 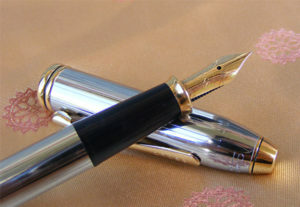 Nice nib with a hing of feedback, and a lovely writer. Bit of a bear to flush efficiently, though. I’ve wanted a Crescent-filler forever, and I adore demonstrators. This was therefore inevitable! Add in the rose-gold trim and I was in love. My first bona fide numbered LE, too! 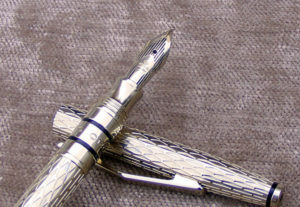 Gorgeous pen in a really stunning finish. I love the MTs. my only (very small) quibble is that they can be a bear to flush thoroughly, but no more so than any vintage lever-filler. A very slim but elegant pen from Cross. Much like the Classic Century, it takes proprietary slim cartridges. Cross doesn’t offer a converter for these, but I managed to gerry-rig a ‘squeeze’ converter from a cartridge and a pen sac. LIke a true cross, it writes beautifully, but it’s a bit slender for my preferences. (B nib shown) Both of these are fantastic! In fact, all my Cross Townsends are great writers, smooth and elegant. They are big and weighty, but I like a pen with a substantial feel. 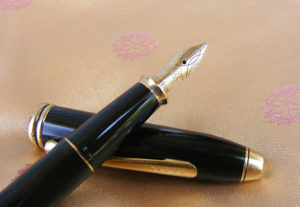 They work beautifully posted (cap posts with a very satisfying ‘snap’), or unposted is one prefers a lighter pen. 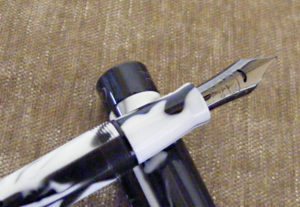 The M was one of the first new, top-end pens I ever got, in fact. It took me through much of my undergrad career, and once I started collecting seriously, it had got siblings very quickly. 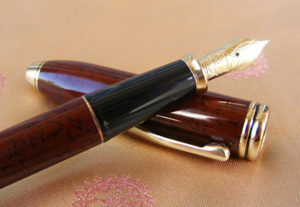 Another wonderful Townsend pen. 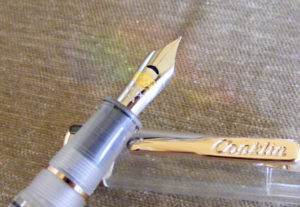 This was probably the first X-fine nib I ever really came to love. 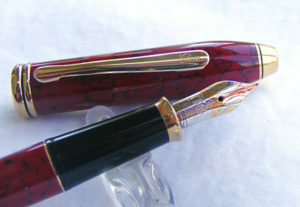 The Cardinal red lacquer is gorgeous; no photo I have seen does this pen justice. I am slightly less fond of the bright chrome; it seems a little brash. I don’t know why; just the deep, rich black, red & brown lacquers seem so much more elegant. Still, like all my Townsends, this is a superb instrument. And another fantastic Townsend. Like the Cardinal, the Sienna lacquer is gorgeous; the photos I have just don’t do it justice.